I really have to give credit to the formation of NORUSH, alongside NDF of course, for opening up the doors to relationships I may or may not have had otherwise. In the scheme of things, not much time has passed since Allan, myself, and the rest of the guys were really involved in the street driving. So much has happened since then though, that it seems like it’s been decades. The past 3 years for me have been non-stop; and I can confidently say that without exaggeration. I’ve had to give up quite a bit, including the lifestyle of driving until sunrise, or even having a street car at all. I got in trouble and couldn’t afford the risk anymore; both financially and legally. I guess you could say that it became a little too ‘real’ for me. I wouldn’t change any of it though because during that time we were able to reach a global audience to share a common passion. We really did start something. And while some of those relationships turned out to be fleeting, many have turned into solid friendships that give no regard to the boundary of distance or time. 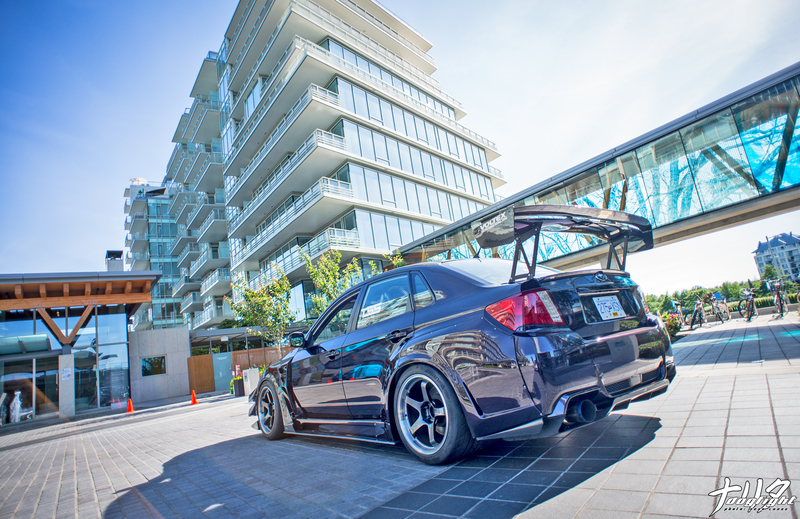 Brian Lau is one such case, and this past weekend I flew up to Vancouver to reconnect with him and share that boundary-less infatuation we all have with cars. I’ve known Brian for a little over 3 years, and am happy for the time we get to spend together. He’s an incredibly generous person and has an outward positivity that radiates wherever he goes and this weekend was no different. Greeting us with a heartfelt hug, and the kind of smiles that are brought about only by the reuniting of friends, Brian met Kayla and I on the US departures level of the Vancouver airport in his daily driven Legacy. We had arrived around 11:30pm Friday night and, after being picked up, promptly made a B-line to the sushi place in Richmond that was closing in about 30 minutes. Small talk on the way to the restaurant was mostly spent catching up on current events, the new status of affiliations, and filling Kayla in with a lot of back-story on things as she’s kind of new to all of this. Although Brian and I talk frequently, there seem to be a lot of specifics left out of casual conversation. It didn’t take long though for the conversation to change to the topic of his STi. We figured we could take the majority of Saturday hanging out, and take some pictures once the sun began to set. 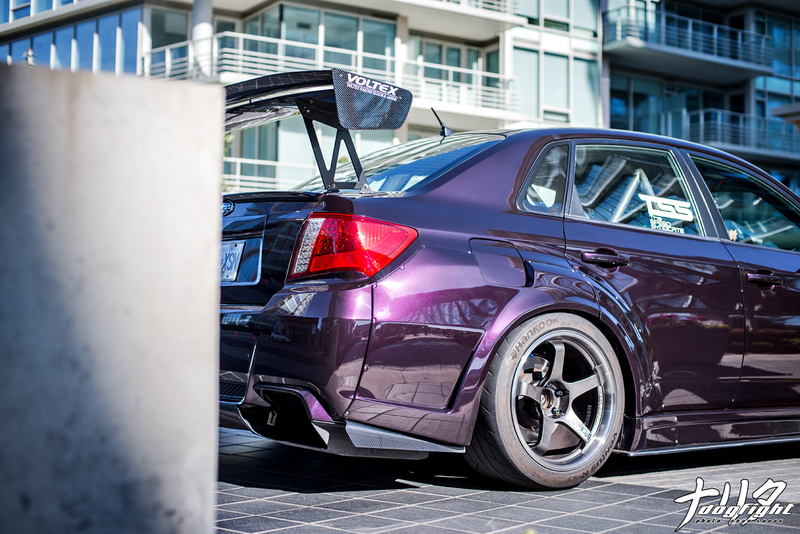 The freshly painted Midnight Purple STi you see here has come a long way (in fact back when it was new it was an off shade of white). The build of this car has been an emotional ride for Brian, as he’s struggled both mentally and financially to bring it to completion. To say it became a necessity to see it through wouldn’t be unrealistic. 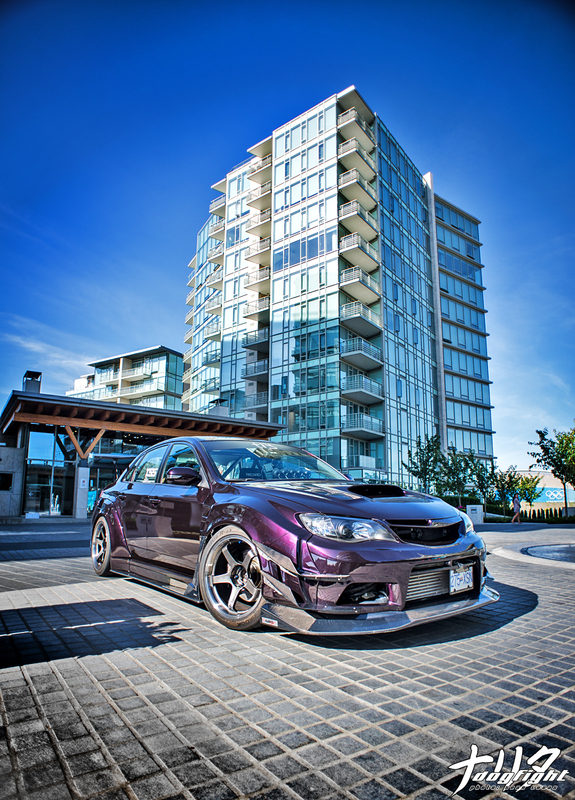 Brian purchased the car new in 2011 when he was working for the Canadian tech company NCIX as Brand Marketing Manager. 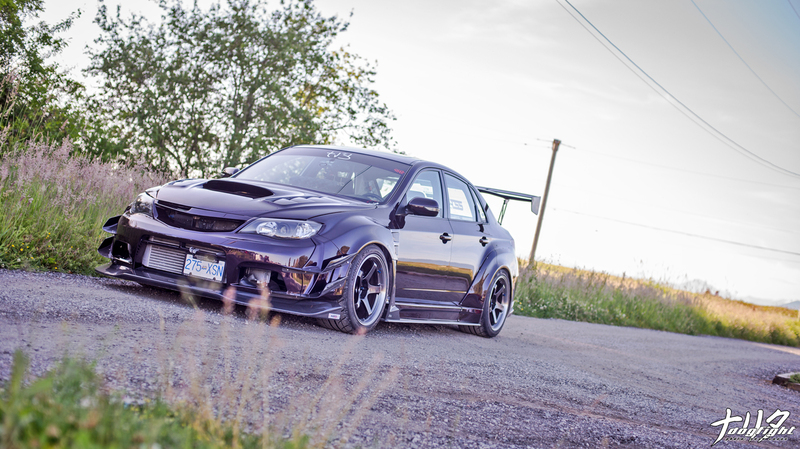 With a solid job, Brian wasted no time in buying parts to modify the newly acquired Subaru with. While he recognizes it now, the parts he was buying were bought with no real intent; no long-term goal. While it was fun at the time, the tally was adding up. As the tech industry slowed, so did work. 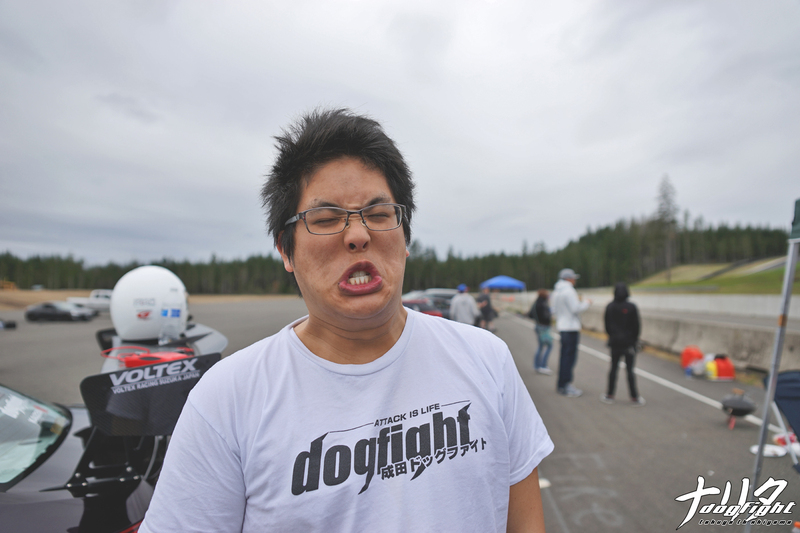 Eventually leaving NCIX, Brian was stuck in a situation where we’ve all been before; his spending had caught up to him. Coming to terms with his situation, he had a difficult choice ahead of him. We all know the emotional attachment we form with our vehicles. It’s easy to say, especially in hindsight, that we shouldn’t have so much attachment to a material object. However, we pour so much of our time and money into them, we spend so much intimate time in their company, that they become more than machines. They become our true friends, and it’s hard to tell a real friend you have to give up on them. Making the decision to keep the car was difficult, but fate had dealt Brian a good second hand. That next Winter, Brian had landed work as a Finance Admin for Quinn Construction. Working in North Alberta at the Cold Lake Weapons Range, Brian was able to rake in a very healthy income. However, work conditions at the camp were nothing short of strenuous and he was away from home for very long periods of time. Pushing through though, he was able to save enough money up to get into the black and put some aside for the future. 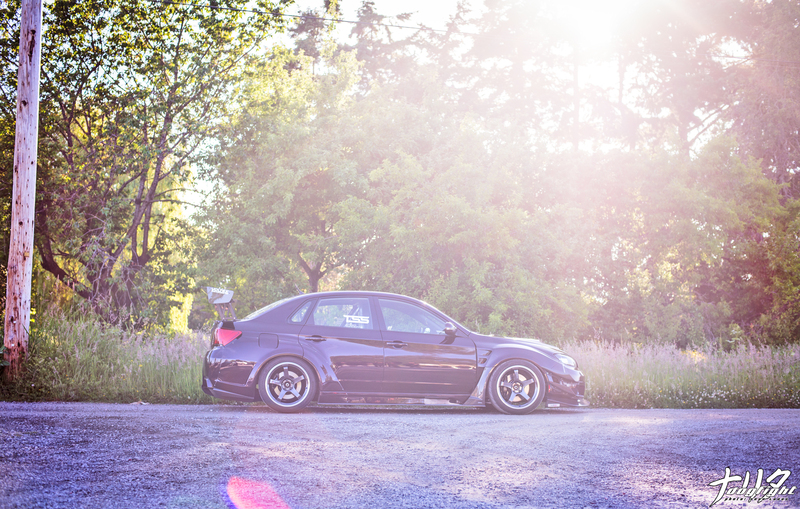 All the while his STi was sitting back at home in a sad, half-built state, and that began to weigh on his conscious. After his contract was up at Quinn, and he was back home for good, Brian decided it was time to finish what he had started. 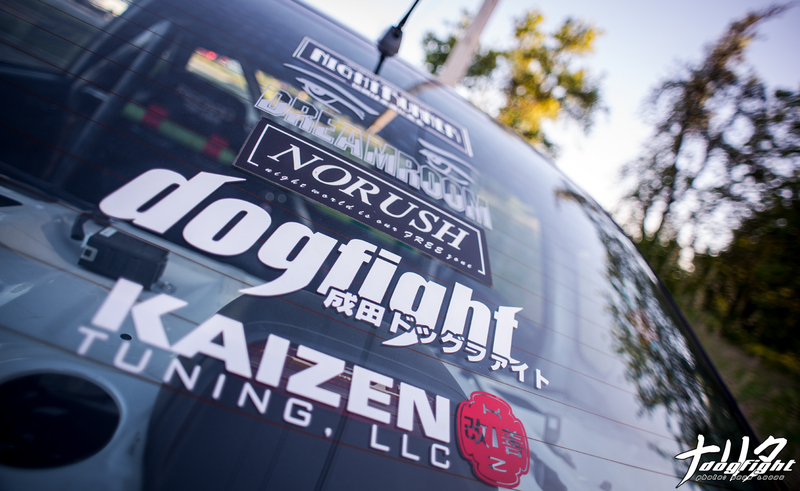 Promptly working with some affluent vendors in the US, Brian began to build the car he had always wanted since purchasing the car. He had a goal, and he knew how to reach it. 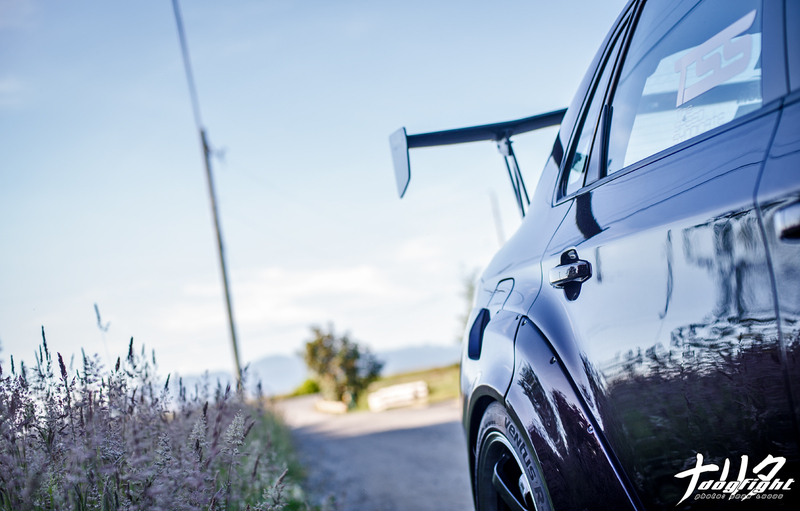 First on the list was to sort out the exterior of the car, and who better to contract to do so than Varis. 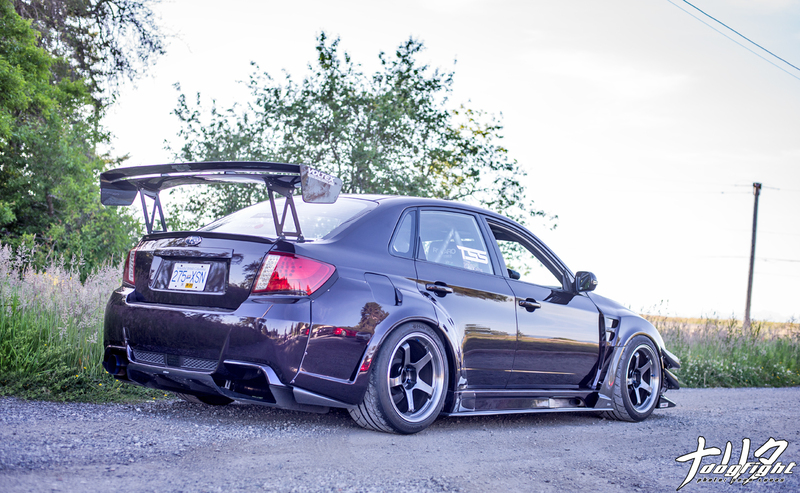 A combination of Varis Type B widebody kit, Varis carbon canards and diffuser, and a Prova rear bumper give the STi an incredibly unique look. 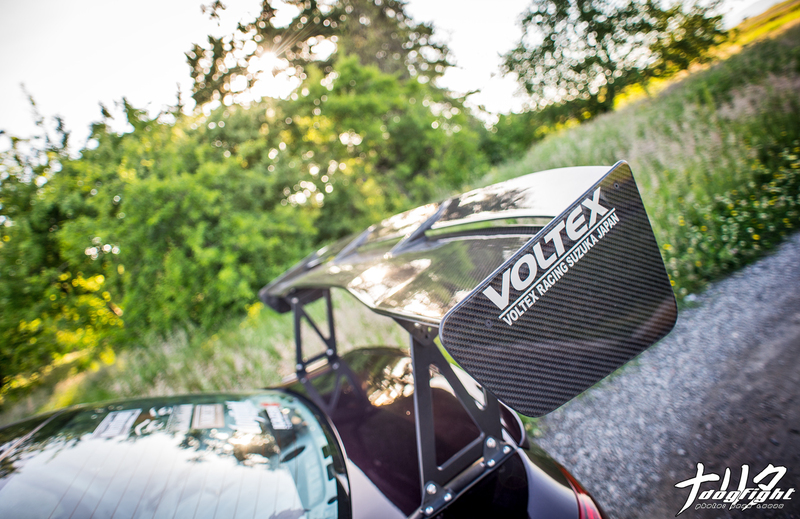 While the Voltex Type 5 GT wing and Valenti taillights tie the rear end together with a performance oriented style. 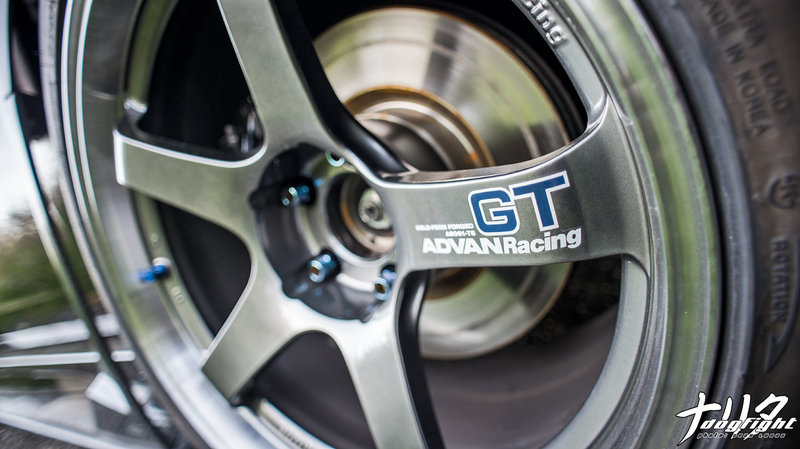 The Tein Mono Sport coilovers allow the widebody fenders to hug ever so slightly the 18×11″ Advan GT wheels at all four corners. 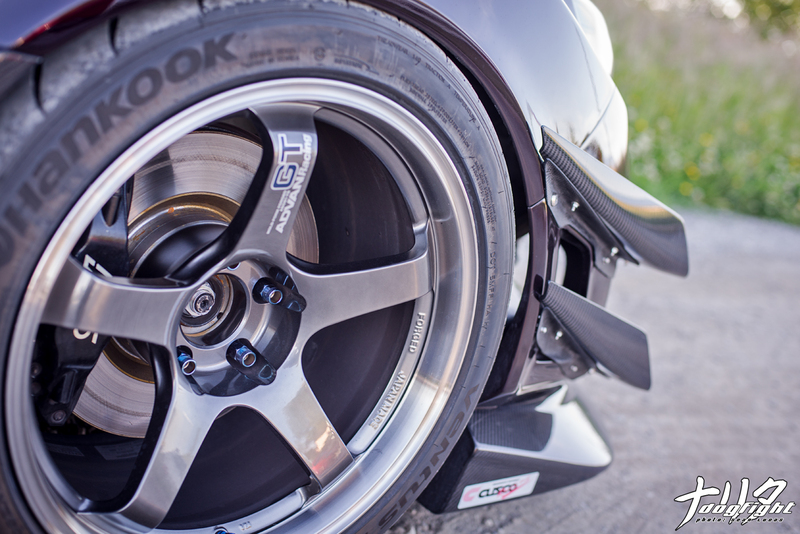 Hankook RS3’s handle the car through the turns. The car’s new color change, which comes from the Nissan GTR33, combined with the new body panels give the car an entirely new look. The color literally looks a different shade at every angle, or when the sun’s rays vary throughout the day. 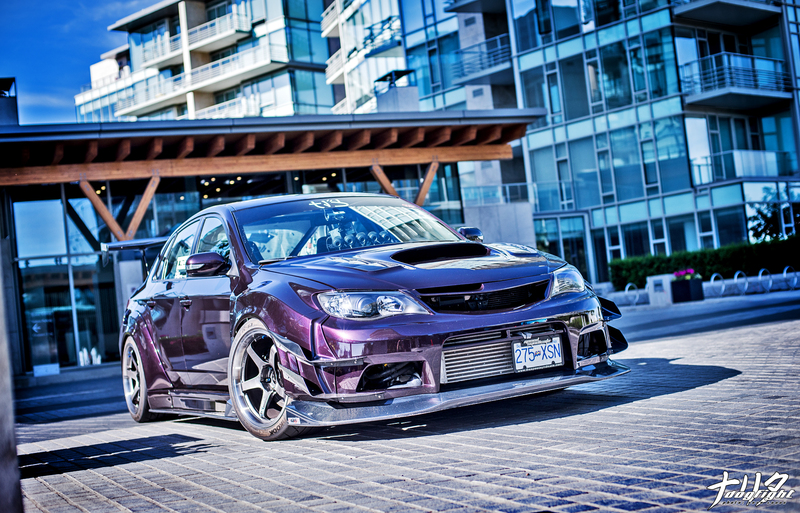 The bright purple can fade fast into a deep black, almost dark blue color depending on the lighting. 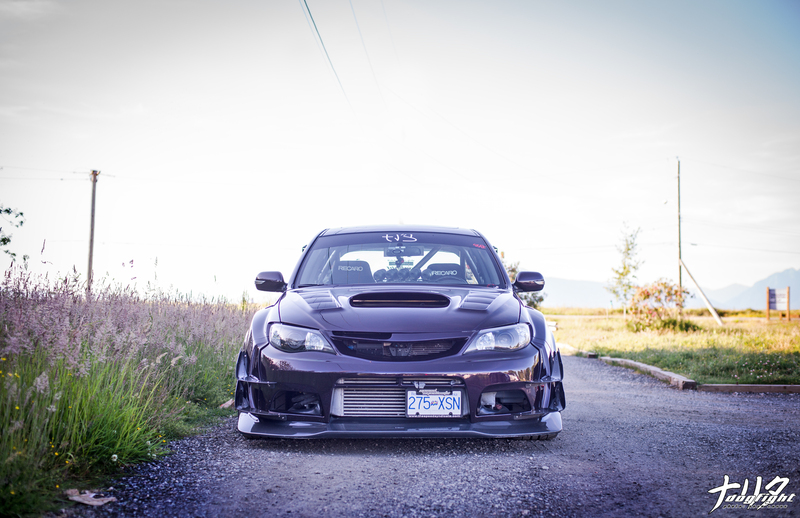 The most aggressive looking end of the car, Subaru’s ‘Hawkeye’ front fascia is hard to beat in styling cues. 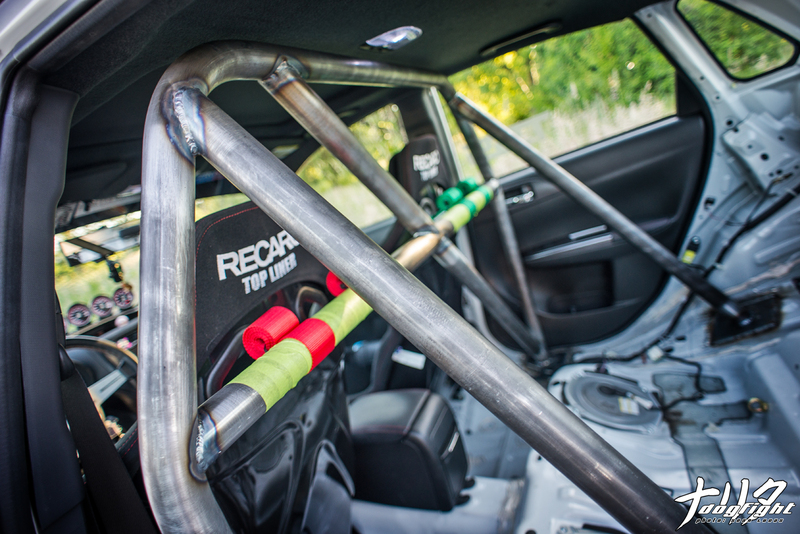 Inside the car, the interior has been mostly stripped from the front seats back, and in it place of the rear seats is a custom TSS roll bar. 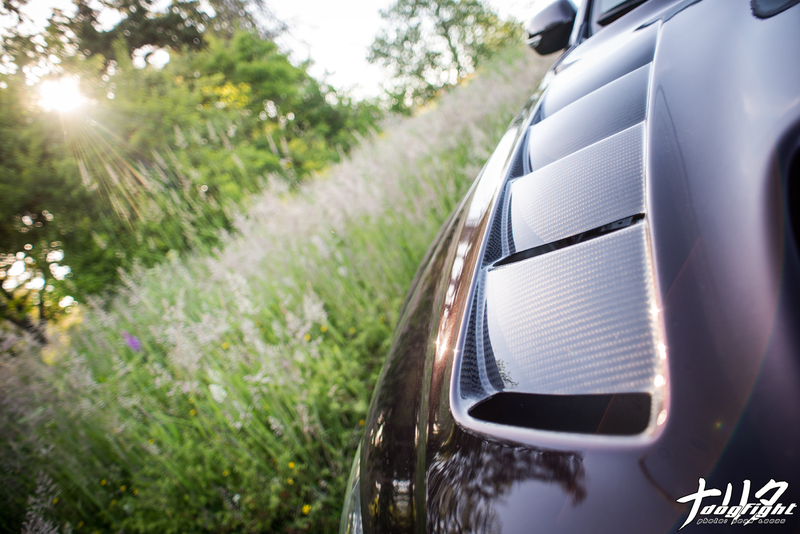 While most of the amenities remain, the car is obviously headed to serving a single purpose. The OEM wheel has been replaced with a leather Nardi, and the heavy front buckets have been swapped for a pair of lightweight Recaros with some custom embroidery for that personal Brilau touch. 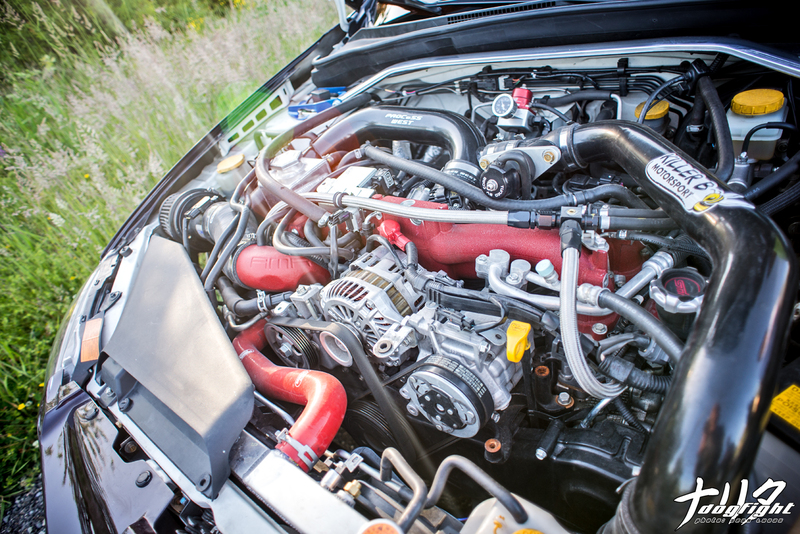 The engine, which has been newly built by Pacific Import Auto out of Seattle, has been much more dependable than the previous build which blew up on the dyno. The new, Benson sleeved block sports a set of CP Pistons, CP H-Rods, and ACL Bearings, which together, allow the car to run more boost at a safer 8.5:1 compression ratio. 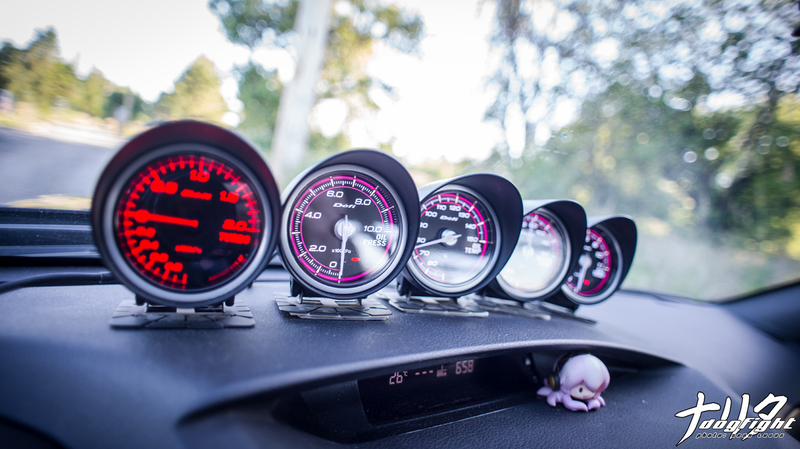 Fuel is regulated by an extensive Aeromotive fuel system in conjunction with FiC 1000cc injectors. 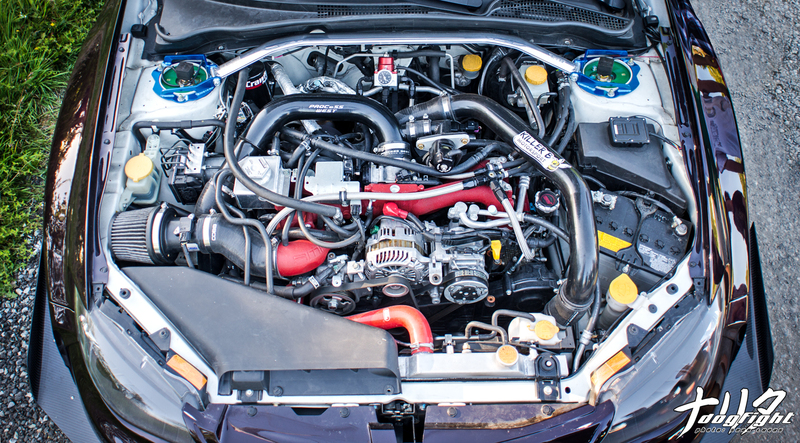 The ATP GT3076R turbine, mated to a Tomei manifold provides the boost the all-wheel drive chassis needs to get moving. Cooling is left to the experts and a Koyorad racing radiator has been swapped in place of the OEM unit right behind the Process West FMIC and Setrab Oil Cooler. Now that the car has a reliably built engine, Brian has begun testing his skills on the track. 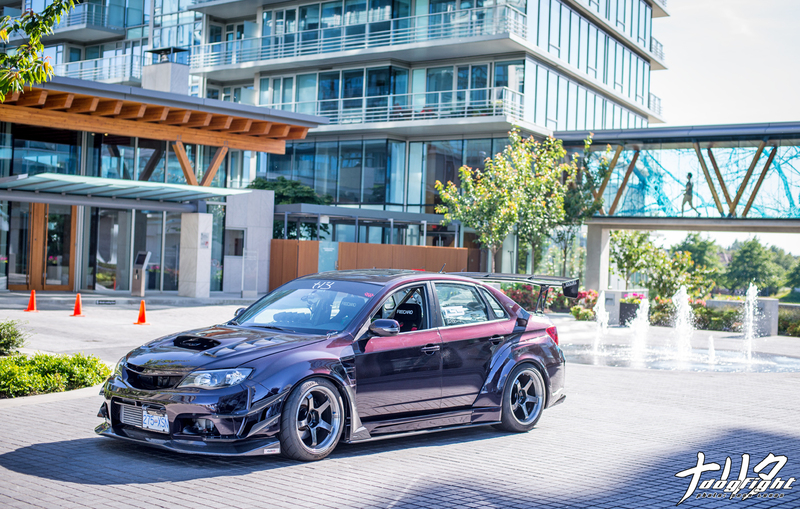 Ridge, located outside Seattle, is the closest road track to Vancouver, and has become his new happy place. Having tracked the car three times now, he has a good idea of how he can approve his driving as well as the car’s suspension setup. The most recent event (this past Sunday), Brian was able to improve tremendously on his previous time, setting a personal best of 1’56.97. 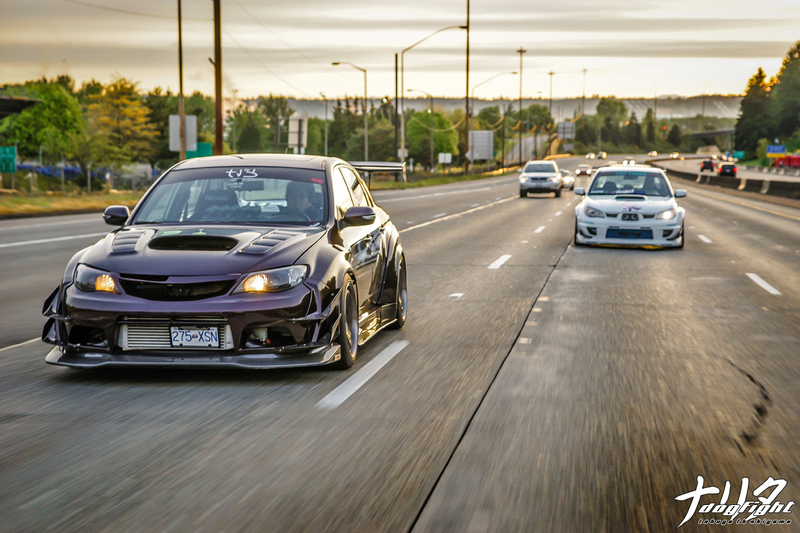 Working on establishing his own business now, Cat6 Connections, Brian is focusing more on enjoying his car than worrying about it – just the way it should be. I look forward to seeing Brian’s continual improvement on the track, and to see what, if any, changes are inline for the STi.